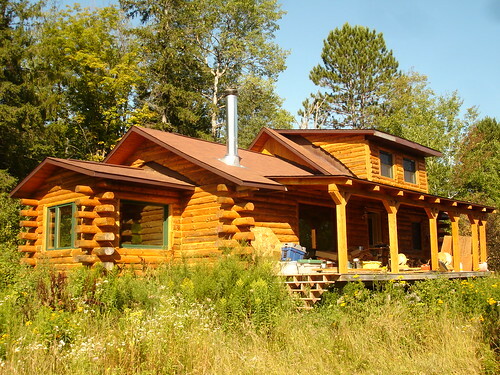 Our newest cabin, Rustic River, is the largest of the three. It sits on the banks of the Rat River, with a private riverbank for you to enjoy swimming or fishing. It has a loft with a queen bed and attached bath, a queen in an enclosed bedroom, and a queen-sized pullout sofa. There is an additional bathroom on the main floor, plus a sunny dining area, a full kitchen, large front porch, Satellite TV, central air, and a fireplace. Out back there is a grill and a fire pit for summertime.